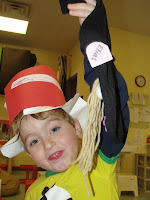 The Little School Community Blog: Happy Birthday Dr. Seuss! One of the many treasures of Dr. Seuss lies in his respect for children as important people. Who can forget the great line from Horton Hears a Who: "A person is a person no matter how small". Dr. Seuss reminds us that reading is fun and that all of us can learn in joyful ways, even in nonsensical words and rhymes. First, did you know that Dr. Seuss' real name is Theodor Seuss Geisel? In May of 1954, Life published a report on illiteracy among school children. This report suggested that children had difficulty reading because their books were boring. This problem inspired Geisel's publisher, prompting him to send Geisel a list of 400 words he felt were important for children to learn. The publisher asked Geisel to cut the list to 250 words and use them to write an entertaining children's book. Nine months later, Geisel, using 220 of the words given to him, published The Cat in the Hat, which brought instant success. The Cat in the Hat (and many other fun and fantastical books by Dr. Seuss) put reading on the map. Every year Read Across America day is celebrated nationwide on Dr. Seuss’ birthday and this year gave The Little School an opportunity to celebrate his work and read, read, read, read! Then on March 2nd, the two and three year old building was a hub of activity. ...and it might have been a yellow day in Ms. May's room as friends focused on hats, and hats, and hats! There was fun to be done in Ms Davian's class with Oh The Places You will Go and musical chairs. Fox in Socks was the tongue twisted star in Ms. Lulu's room. Friends made sock puppets and played in blue goop. The Foot Book came to Ms. Arryan's room. Friends enjoyed painting with their feet and Ms. Melissa’s infant friends came to visit as well. They also read One Fish, Two Fish, Red Fish, Blue Fish. All of these activities went on simultaneously in the building and the teachers from each classroom hosted these activities for their neighbor classrooms. In our Soft Room, parents read to children from different classrooms, particularly our infant and one year old classrooms. 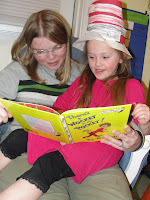 Some favorite reads were Mr. Brown Can Moo, Can You?, and naturally Green Eggs and Ham. Ms. Laura and Ms. Kelly's class spoke for the trees and made Truffulo trees in honor of The Lorax. Ms. Dana and Ms. Jennie celebrated the book Wacky Wednesday by wearing wacky clothes and creating a “wacky” classroom, and they also played “Stick the hat on the cat”. Every voice counted in Ms. Diana and Ms. Lauren ‘s class as they made their own little Whovilles (represented by a bead) stored in clover (dried flower head) to protect the Whos in Whoville in honor of Horton hears a Who. Thanks to Ms. Arryan who reminded us to celebrate Dr. Seuss' birthday and thanks to Ms. Lulu for coordinating the classroom visits in the two and three year old building. It was a great success, inspiring us to share activities across classrooms more often. Please remember that you are ALWAYS welcome to visit us at the Little School and READ. Read to me stories of magical times. Read to me tales about castles and kings. Read to me stories of fabulous things. Read to me dragons and dragon-book fights. When you are finished -- please read them again. Nothing without Joy in reading. P.S. Thanks for reading the blog!